Admit it; you suffer from cable clutter. I know I do. Even though I have a 27-inch iMac with lots of internal storage and decent speakers, I have connections to: external speakers, an external hard drive, an iPad, an iPhone, and a Leap Motion controller. And, of course, a surge protector to protect all these gadgets. The result? A crowded desktop. One simple solution: the US$19.95 Neet Cable Keeper, which helps you organize, protect and identify all those cables from computer and mobile devices. It’s a colorful sleeve that sports a wire that lets you “form” the cable in a variety of shapes to prevent tangles. Installation is simple. The full zipper opening allows for one or more cables to be easily added. The NEET Cable Keeper is three feet long (so provides some wiggle room) and can be used to safely roll up your cables for transport. The NEET Cable Keeper fits just about all mobile device cables and chargers from companies such as Apple, Samsung, HTC, LG, Blackberry, Motorola, Nokia, etc. So if all those cables are out of control on your desktop, this little item offers a handy, NEET solution. This year's International Consumer Electronic Show concluded just over a week ago with the best in emerging innovation and technology in industries, including: health care, transportation, safety and social connectivity. The world's leading corporations, emerging startup companies and industry professionals gathered at the Las Vegas Convention Center to discuss, test, and view the next in what would have been impossible, however, it seems that impossible is now nothing with the constant emerging technology seen every CES. This year was extremely notable, marked as the largest CES show in history with over 3600 exhibitors covering more than 2.2 million net square feet, many ground breaking announcements, launches, and panels - with many solutions presented to solve many of today's problems in the industries mentioned above. The most talked about trending topics (based on social media) via CES 2015, included: internet of things, connected home, virtual reality, smart phones/smart watches, robotics, drones, ultra HD/4k, auto tech, wearables and 3D printing. A solution to a quite frustrating, annoying problem many of us encounter: tangled headphones or cord wires. The NEET Cable Keeper is a effective solution, providing cable organization, as well as, protection to put a end to tangled or damaged cables. This highly versatile cable organizer, the NEET Cable Keeper, is a "must have" for anybody who is sick and tired of dealing with tangled cables and that's just about everybody. It's the first of its kind, designed to accommodate all the latest mobile device and computer cables like a glove. The NEET Cable Keeper is constructed in a sleeve design, made with brightly colored fabric that is soft to the touch. The design also incorporates wiring that gives it the ability to fit a variety of cables and cords and keep them tangle free. Application is easy as well, thanks to the cable keeper's full zipper opening, making it possible to add one or more cables instantly. This is a universal cable cover that's designed to make it easier to identify, protect and organize just about all of your cables and cords and keep them tangle free. The NEET Cable Keeper fits virtually all mobile device cables and chargers including a long list of items from top brands like Samsung, Apple, HTC, LG, Blackberry, Motorola, Nokia, Sony Ericsson, Philips, Siemens, Huawei and more. In addition, it handles most tablets, iPads, smart watches, speakers, Bluetooth devices and most standard phone cables. The NEET Cable Keeper is 3 feet/100cm long which allows it plenty of room to provide a ìuniversal fit. The streamlined, vibrant and durable NEET Cable Keepers are built to handle the "on the go" lifestyles of today's tech savvy individuals. This cable protection solution makes it easy to form a variety of cables into handy compact shapes. The cable keeper also takes on some of the strain and stress that typically comes into play with cables which in turn lengthens the life of your cables; a huge benefit when you consider how expensive most of todayís high tech cables are. The Cable Keeperís zipper pull feature makes it possible for the user to install new cables, additional and even multiple cables, giving you the opportunity to organize all the cables you need in one, easy to install (just a quick zip) attractive sleeve. The vibrant fabric sleeve adds a bit of flair to your cables while protecting them from fraying and making it easy to determine which cables are yours, a common concern in busy households. The fabric is durable as well, made to absorb everyday strain and even projects cables from pets. In our opinion, the NEET Cable Keeper is a must have for any home or office, providing the user with a reliable way to identify, organize and protect their cables. Just zip the sleeve open, tuck your cable or cord inside, and zip it shut. Now you'll be able to find your cables because the eye catching colors will make them stand out. On the other hand, if you've been looking for a cable storage solution that will allow you to safely roll up your cables, making them easy to take with you, NEET Cable Keepers can do that too. Even more important, there simply isn't a better way to avoid the frustrating mass of tangles cables and cords. The Consumer Electronics Show may be over, but we've got some of the latest and greatest gadgets before they hit the market and Courtney's checking them out! Stumbling through the Sands Expo, I came across one of those seemingly insignificant products that turn out to be an elegant and simple solution to a never-ending problem. In this case, I found the NEET booth and its assortment of Cable Keepers. Something the company calls the “World's Simplest Cable Management Solution”. Using one of NEET’s Cable Keepers is like having a zippered pants leg for your earbud and charging cables. The 3 ft/1 m cloth pants leg (sleeve might be a better analogy) has a zipper running its entire length. To use, you unzip the sleeve and lay your cable(s) inside. If any of the cables are longer than 1 meter, you can “shorten” it by folding and tucking the cable inside the sleeve. When the cables are in place, you zip the sleeve closed; and the Cable Keeper keeps your cables snugly together. The real beauty of the NEET Cable Keeper design, however, is the use of a stiff-but-bendable wire sewn inside. The wire helps relieve strain on the cables, especially at the connector termination points. The wire is also strong enough to maintain its position once bent into shape. There are a wide variety of applications, including securely wrapping the Cable Keeper (and the wires it contains) around your wrist or mount. It can also be shaped to make an impromptu smartphone stand. Cable Keepers come in 13 different colors and are available for sale on Amazon.com now. Pricing is $12.00 for a 3 ft/1 m length. Additional lengths are expected to be available soon. Gift idea for: The traveler who travels with multiple electronic devices. Field test results: I assigned a pink Neet Cable Keeper to my iPad charging cable because it matched my iPad cover. Instantly I could distinguish my iPad cable from my iPhone and GPS cables. The pitch: "The Neet Cable Keeper is a multifunctional cable management solution that will organize, protect and help users identify their mobile device cables." Why we love it: No more unidentified cables! Looking for great holiday gift idea that will not break the bank? With the holidays here, shopping is probably on your mind as much as on you wallet. Colorado’s Best Meaghan Mooney showed us some great gifts that won’t break your budget and are perfect for everyone in your life. Visit Colorado's Best TV for more holiday tips. Salt Lake Magazine - Day Two: The Children's Hour Pkg. Day Two: The Children's Hour Pkg. The NEET Cable Keeper is a multifunctional cable management solution that will organize, protect and help users identify their mobile device cables. The NEET Cable Keeper is a sleeve made with vibrant fabric that feels great to the touch and has a wire designed to allow users to form the cable and prevent tangles. Installation is simple with the full zipper opening, allowing for one or more cables to be added with ease. The NEET Cable Keeper is designed to eliminate frustrating cable tangles. Neet Products provide the solution you have been waiting for. If you’re a techie, or even if you just have a couple of devices, you’re probably always having to detangle cords. I always find myself trying to differentiate between the different cables I have plugged into a specific outlet as well. Neet has the solution. Their zip-up cable keepers come in various colors. They are wired so you have control. You can fold the cable to make it shorter and then zip it up to keep it in place. You can insert more than one cable in one cable keeper so that yo contain your clutter. The various colors help you tell them apart as well. Neet cable keepers will also help your cables last longer by protecting them. You can purchase them separately, or with included micro USB or iPhone cables. They also have outlet splitters for USB cables so that you can plug more than one device into one outlet. And the colors give your items personality as well. Neet cable keepers are the solution you’ve been waiting for. 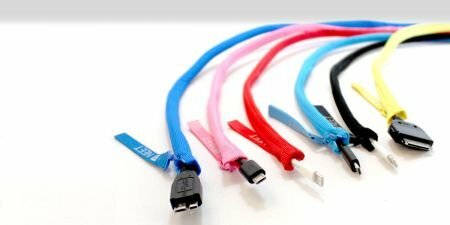 Whether you use them for your desk, handbag, or even wind it into a wristband, these cable keepers are fun and stylish. The zipper closure makes them easy to use and the wire lets you manipulate them. I can’t believe I’ve gone so long without!